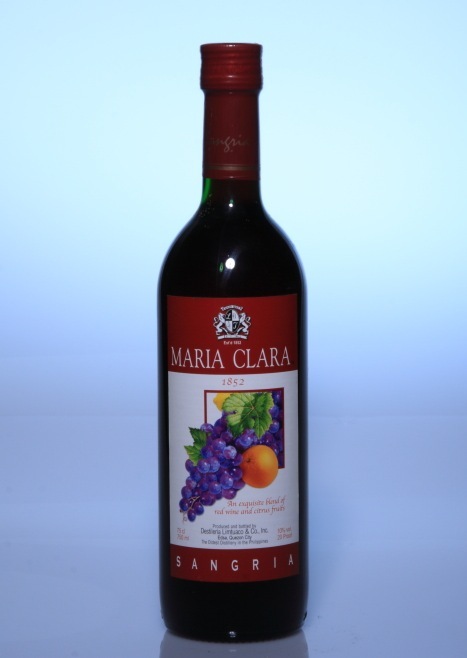 Maria Clara Sangria Red Wine by Destileria Limtuaco Philipina. This wine was a souvenir from my friend. I could not find information when this wine was being produced. But the label stated that the company was founded since 1852. Also, I don’t know what kind of red wine it is. It only stated red wine. I don’t like the fruit picture on the label. It makes this wine look like juice instead of wine. Thats a portuguese name, funny. Philippine was Spanish Colony for more than 300 years. Do you think that is one of the reason? Yeah, must be. Never heard of wine there though. Nor beer. Too tropical I think. Maybe its imported. Well, the label said they are the oldest distillery in the Philippines since 1852. 🙂 San Miguel Beer from Philippine is quite famous. I like San Mig Light Beer. Thank you for visiting my blog and for your honest comment. 🙂 Glad to know someone have experienced one of my wine collection. Yes wine is good for health. There are some good books about it To Your Health! Two Physicians Explore the Health Benefits of Wine and Resveratrol: Unleashing the Benefits of Red Wine . Glad to know other view point about the label. Do you taste this wine not too strong? I have not tasted it. Only have one for my collection. This wine is unique for my collection because its label look like fruit juice for me. 🙂 Also, the label shows grape, orange, and lemon fruit pictures. It is an unique combination for red wine. Sadly, label have tell no information about ingredients. Also, I couldn’t find company official website. The label mentions that it is a blend of red wine and citrus (juice). The result will probably be juice with a very small amount of alcohol (10 %). If you are a wine lover, you will certainly be very disappointed when drinking it. You can add some fresh fruit and gin and drink it chilled as a cocktail. hope this site would help. i dont know anything about wine but this has a fruity taste and a little kick. I drink 1 glass before going to sleep. It calms me at night. Cheap for a bottle. Costs only P128 or $3. You can buy this at any convenience store or supermarket. As I’ve said I’m not a wine fan because of it’s strong taste. But this is perfect for me. Fruity flavor with a kick. Like fruit juice in some ways. I’m not a wine lover because of it’s strong taste. I like wine sweeter. And this is perfect for my taste. Yes, it tastes like fruit juice w/ a slight kick. I drink this 1 glass every night. It’s also cheap for Php128 or $3. You can buy this at any convenience store or grocery store. Maria Clara stands for a female name during spanish era. Maybe because this is for women’s taste? That i’m not really sure. Heh, I love Sangria the worse was pretty good. I’m glad you liked my sign of Ducks Walking. Thank you for visiting my site. I thought it was kind of funny. Glad to meet other wine lover. Please visit again once you have time. That Ducks Walking sign in your blog is so creative. Thank you for sharing. Thank you for visiting and the like of my Weekly Photo Challenge post representing Surprise. Hi Ninja, thank you for visiting my blog. This wine is not pure made from grapes. It was mixed. Therefore they put many fruits picture on the label. I haven’t tried to use it to marinate meat. If you do, please let me know how it taste. Anyway, I prefer to use shiraz to marinate grilled meat. ive had this wine while in cebu–it is good. It is a popular wine in Philippine, right? very popular wine,all over the philippines,because of it’s extraordinary taste,also clean. Do you know what kind of wine is this? Give respect to the beautiful Islands of the Philippines. Plus if you want to get pretty drunk, you should try Lambanog if you have any chance to visit the country. Just sharing. i have a bottle of destileria limtuaco 1852 r u interested? Well unfortunately this is not yet availablet is US stores but you can try an all natural product with no added flavoring from Destileria Limtuaco like – MANILLE LIQUEUR DE CALAMANSI or PARADISE MANGO RHUM which are already available in other US-Filipino malls like SEAFOOD CITY. Is there expiration date for this wine, nothing is mentioned in the bottle/label ?